Pamela writes Planet Watch for Natural Awakenings Magazine Westchester/Putnam/Duchess edition. She is a prize-winning speaker and a member of the National Council of Geocosmic Research (NCGR), the International Society of Astrological Research (ISAR) and the Association of Astrological Networkers (AFAN). She holds NCGR PAA certification for consulting. Pamela is a 7th generation Reiki Master of the Usui System of Natural Healing with lineage linked to Hawayo Takata. She owned and operated Sunburst Oasis, a deeply loved and respected wellness gift and service center in Mt. Kisco, NY. 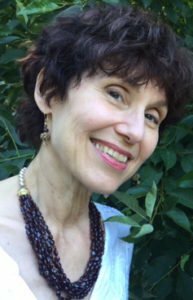 She co-coordinates the Westchester Holistic Network. “We are dominated by our 24/7 society — lighting conquers night, digital messages crowd one’s ability to reflect and renew. Yet technology works best when we mirror the rythmn of nature. We are part of a dynamic Universe. The cycles in the heavens provide synchronistic information to those who pay attention to them. The tool of astrology allows me to interpret cycles here on Earth. As you find your way to flow instead of fight, this economy of action leads to a beautiful life. If you want to gain perspective and aim for clear goals, I can help. How did I get my ability to guide, mentor and advise? Experience is part of the road to wisdom. I read astrology books in college, but my main focus was on art and painting. I went to NYC and in time decided the “art world” was fascinating but not my road. As I recovered from divorce and looked for direction, I picked up a tarot deck, something I’d not done since a teen. I began a deep study of metaphysics: tarot and astrology, meditation and Jungian psychology. NYC is a wonderful place to learn. To support these habits, I worked in multimedia production companies. I studied tarot with a Greenwich Village maven with silk flowers in her hair and created a 3-dimensional version of the Major Arcana which was exhibited in the late ’90s in DUMBO (DownUnder the ManhattanBklyn Overpass), when DUMBO was far from the chic neighborhood it is today. The tarot is a visual language that lends itself beautifully to artistic expression. I have undergone the rigorous testing of the National Council of Geocosmic Research and hold NCGR PAA certification for astrological consulting. To become a NCGR Professional Alliance Astrologer, one studies astronomy, addresses ethical concerns, and acquires a working knowledge of different schools of astrology. At present, I serve as one of NCGR’s examiners. My business experience stems from a wellness and metaphysical gifts storefront I owned for six years. Today I enjoy the freedom of working with people virtually and in person. As a Reiki Master, I imbue every session with the power and focus of healing energy. A good astrologer always hones her art. I have studied symbols and psychology at the CG Jung Institute in NYC and tarot through several teachers. I am a “graduate” of Jungian analysis. The better I know myself, the more effective my consultations and coaching. You can schedule a session through zoom, skype or telephone. In-person in NY occurs when I’m in town. Home office is in Chapala, Mexico. Sessions are by appointment only. Contact me to begin the conversation. Ongoing sessions or packages are a fit if you want deep support and mentoring to realize goals. Subscribe to find out about my webinars and events.